Aphids sucking the life out of your beautiful roses? Whiteflies hanging around your beloved tomatoes? Don’t want toxic synthetic insect sprays around your family and pets? 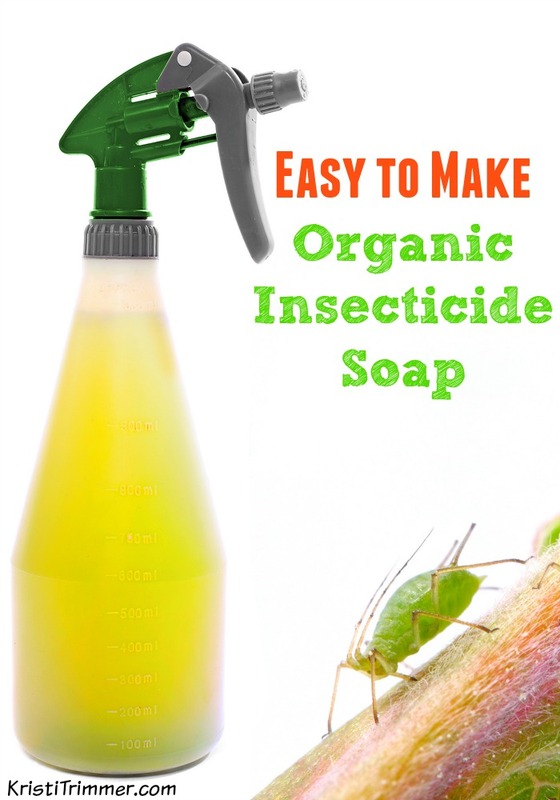 Then you should make your own Organic Insecticide Soap with materials right in your own kitchen! Mix all of the above ingredients together in a large water bottle and fill the rest of the bottle with water. Shake vigorously. Apply this mixture to the top and bottom of the leaves of the plant. If you have an aphid or whitefly problem, do this every 3-4 days until all the eggs have been killed. Spray the dirt around the plant to prevent any eggs from hatching. If it rains, reapply this insecticide soap when the weather clears up. If you don’t want to make your own insecticide soap, but would rather purchase an organic insecticide, I recommend both Garden Safe and Safer’s brands. Won’t the garlic get stuck in the spray hose? Yes, it can. I use the spray hose that has the little screen on the bottle. Another trick is to put the ingredients in the blender then pour the mixture over a sieve. Combine this liquid with the rest of the water in the water bottle. I like the sieve idea, you get all the good stuff and no chunks! Regardless I need this because my peppers are ALWAYS infested with aphids. And since aphids come out pregnant it’s a tough cycle to break! Cheers. This is exactly what I’ve been looking for, an insecticide that is easy to make and is organic. This is brilliant! I’m always on the lookout for gentle non-chemical remedies! This is great. I hate using the chemicals on my plants. What is the cayenne pepper? Where do i get it from? Does this remedy attract any others bugs or rodents? No it does not. It washes away with each rainfall so you need to reapply it. Bugs and rodents aren’t fans of pepper or soap!